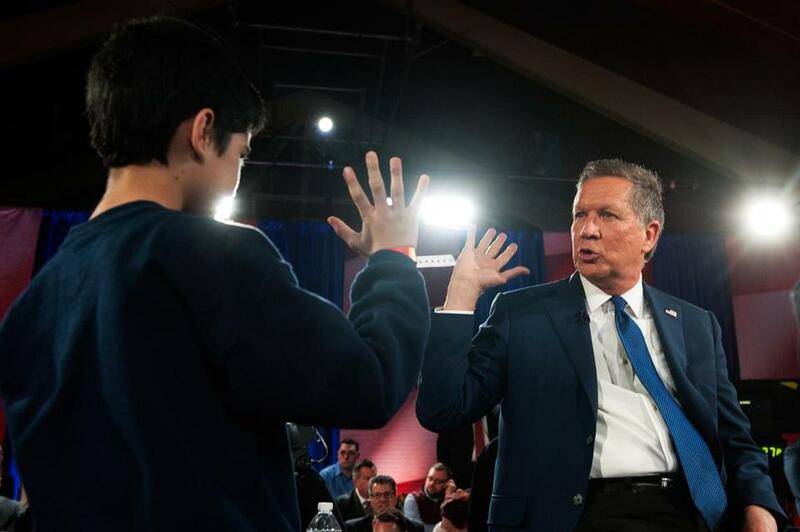 Republican presidential candidate John Kasich high-fived a supporter during a campaign stop in Queens on March 30. Don’t count John Kasich out. Yes, judged by traditional standards, he is a tortoise racing with hares. Actually, make that mad hatters. Primary Season 2016, however, is not a normal campaign, but rather one that’s lurched into a gothic GOP horror story offering Republicans a disquieting choice: Do you avoid Frankenstein’s monster by flinging yourselves into the embrace of Count Dracula? That is, try to stop Donald Trump by rallying to Ted Cruz? The Democratic and Republican presidential candidates seek challenge-proof majorities. Either way, polls suggest defeat looms on the fall horizon, a point Kasich underscores while campaigning in New York. As his rivals’ “negatives creep up higher and higher, it brings into question whether we will get really decimated in the fall, not just with the White House, but the Senate and from the courthouse to the State House,” Kasich said in an interview. He made a similar point to reporters at the New York State Capitol, where he pitched his candidacy with Republican senators and assembly members, the type of November-focused pols likely to end up as convention delegates. His delegate message, he said later, is: Make me your choice on the second ballot, which “is the way Lincoln did it” in 1860. With the Republican National Convention now very likely to be contested, Kasich thinks Trump will start to fade after the first ballot, at which point many delegates will no longer be committed to voting for him. Then they will start looking at general election viability. On Tuesday, the Ohio governor delivered a related message in a speech to the Women’s National Republican Club in Manhattan, recounting the gloom and doom, unworkable nostrums, and divisive rhetoric from Trump and Cruz and casting himself as the optimistic, experienced, Reagan-like figure who could unite both the party and the country. As he campaigns on a modest budget, with relatively small ad buys, Kasich is trying to live off the free-media land. That’s always tricky. Still, he’s drawing sizable crowds and lots of coverage in New York. That said, the case for Kasich would obviously grow stronger if he can show some momentum now that the primary schedule has moved to states where his pragmatic conservatism should have more appeal. Places like New York, on Tuesday, then Connecticut, Delaware, Maryland, Pennsylvania, and Rhode Island, all on April 26. I noted that man-made climate change has been dismissed by both Trump, who once said it was made up by the Chinese and now calls it a hoax, and Cruz, who has in essence said it’s a conspiracy between scientists and liberals to extend government control. Kasich has an evolved, halfway position: Climate change is real and humans contribute to it, but measures to combat it have to be economically realistic. So what does he think of the outright dismissals by Trump and Cruz?